"Emotionally vulnerable Science Teachers" made me giggle somewhat, mostly because I work with Science Teachers and none of them are what I would term emotionally vulnerable. Jim quite often surprises me with these strips. 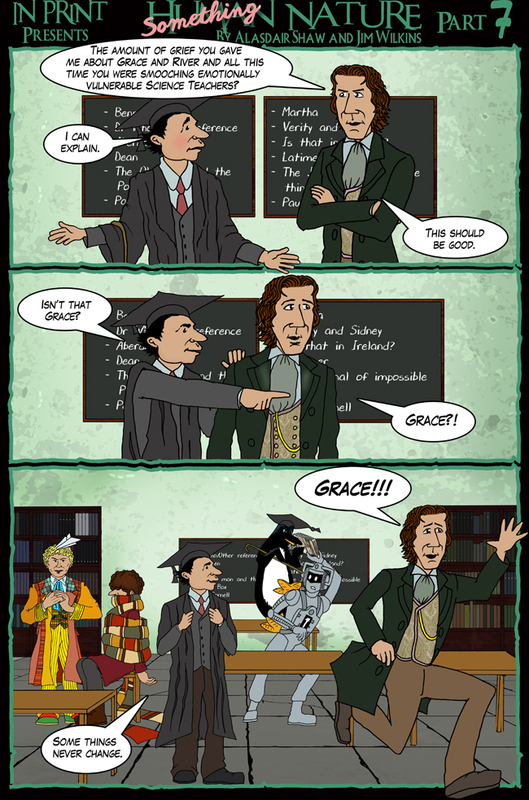 That last panel, for example, didn't have the other Doctors in the background in the script, but I think we can all agree that they belong there. In all the years we've been doing this I can only think of two occasions where I've asked Jim to alter something he's done for, although it's possible Jim'll recall more. Given that we're coming up to the 100th main strip and multiple side strips I think that says something about our working relationship. Next week we have a guest strip, either from Jesse Lax or Paul Salvi, we're still working on scheduling. But both of these gentlemen are providing guest strips help Ness catch up to my late writing. So, yeah, guest strips for the next couple of weeks, but you guys know the quality of our guest contributors, you won't be disappointed.